The distinctive style of Japanese art known as Rinpa embraces bold, graphic renderings of natural motifs and formalized depictions of fictional characters, poets, and sages. 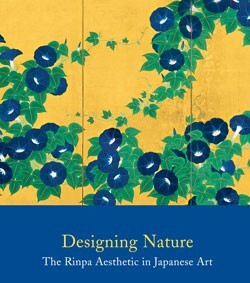 An aesthetic that arose in Japan in the sixteenth century and flourished until modern times, the Rinpa school is celebrated for its use of lavish pigments and its references to traditional court literature and poetry. Central to the Rinpa aesthetic is the evocation of the natural world—especially animals and plants with literary connotations—as well as eye-catching compositions that cleverly integrate calligraphy and image. Featuring beautiful color reproductions of some ninety works— including painting, calligraphy, printed books, textiles, lacquerware, ceramics, and cloisonné—from the Metropolitan Museum of Art and other notable public and private collections, Designing Nature traces the development of Rinpa, highlighting the school’s most prominent proponents and, for the first time, the influence of this quintessential Japanese style on modern design aesthetics in both the East and the West. John T. Carpenter is Curator of Japanese Art, The Metropolitan Museum of Art.